If you're 1 of the 3 people left who aren’t familiar with Woot, it is a family of sites which includes Shirt.Woot, Wine.Woot, Sellout.Woot, Kids.Woot, and the main site, Woot.com. Every night at 12:00 AM CST, each site puts up a new deal that is available for 24 hours or until it sells out, which ever comes first. These deals can range from a $300 32” HDTV to a $1.99 stuffed flying monkey (seriously) to a bag of crap (also serious - those are awesome). 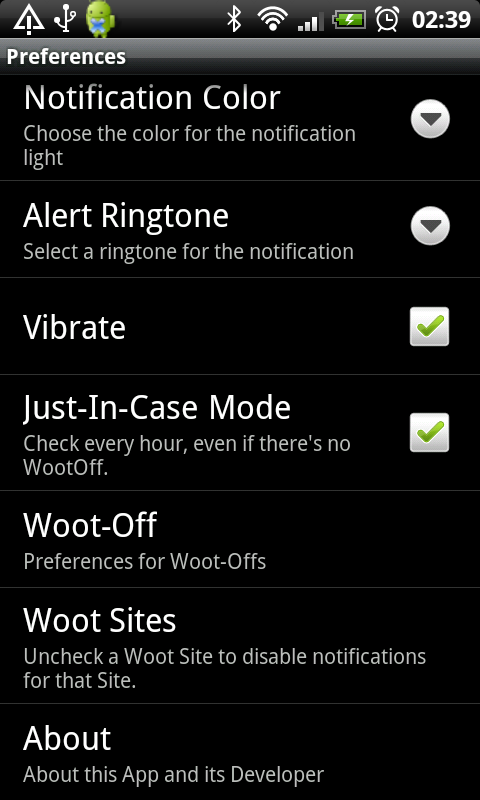 The idea behind WootWatcher is fairly simple and is executed beautifully. 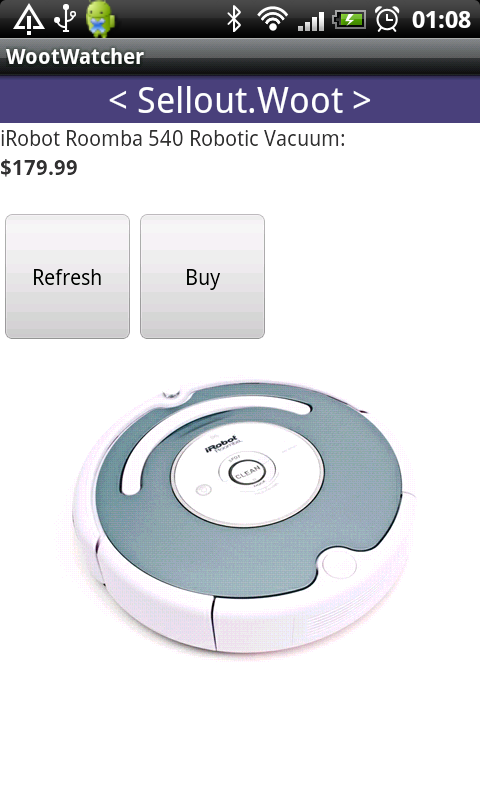 The app runs in the background and automatically notifies you when the latest Woot deals are updated. 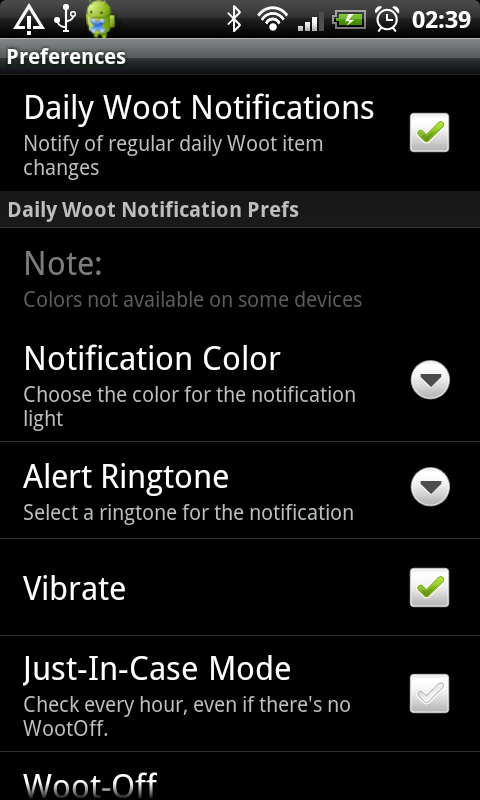 Notification options include the ability to display an icon in the notifications area, assign a ringtone as well as vibrate, and specify the color of the notification light. It even supports the trackball light on the Nexus One. When you pull down the notification shade, it displays a text preview of the day’s new Woot. 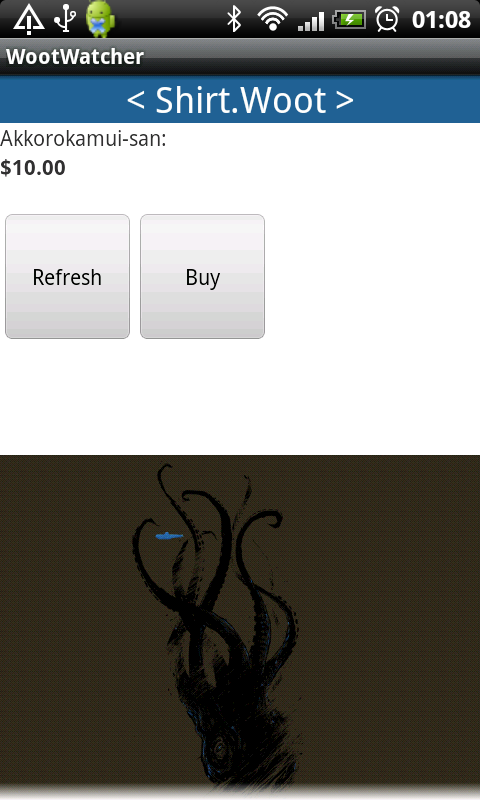 Tapping the notification will launch the app where you can see an image of the item. Want more info? 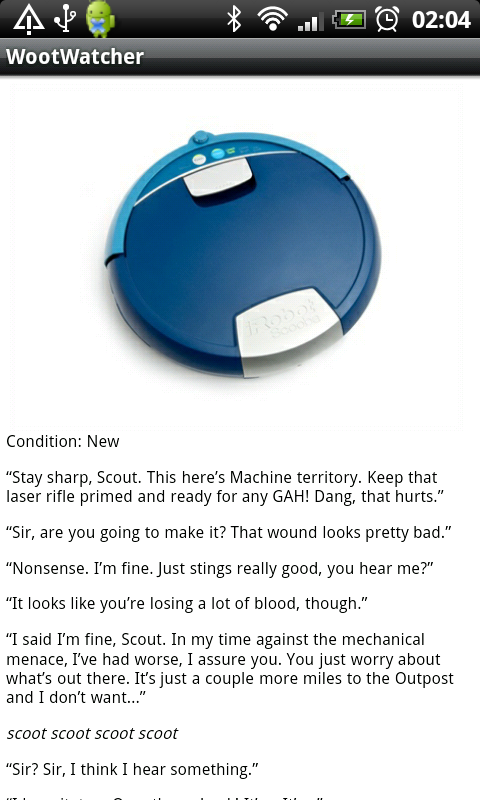 Just tap on the image to read the usual Woot anecdote along with additional details on the item being sold. Ready to buy? 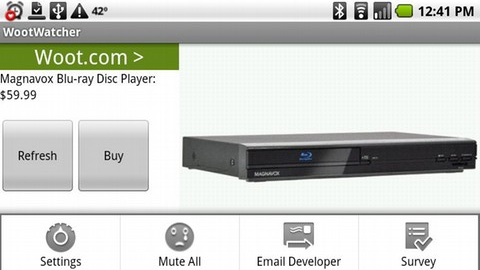 Simply tap on the ‘Buy’ button and the browser will launch directly to the login page on the Woot site. To view the deals available on the other Woot sites, just swipe left or right - it's small, productive improvements like this that make getting a dedicated app worth it. WootWatcher really shines during Woot-Offs. You can think of a Woot-Off as a fire sale where everything must go. It’s not unusual for something to sellout within minutes during a Woot-Off, so you want to be sure you’re alerted as soon as a new item goes up. During these special sales, WootWatcher continuously checks for new Woot deals and notifies you accordingly. Additionally, it displays the inventory level percentage of the current item so you have an idea of how much stock is left before the next item goes up. If you’re paranoid about missing the latest Woot, WootWatcher provides a “Just-In-Case Mode” which pings Woot every hour for updates. 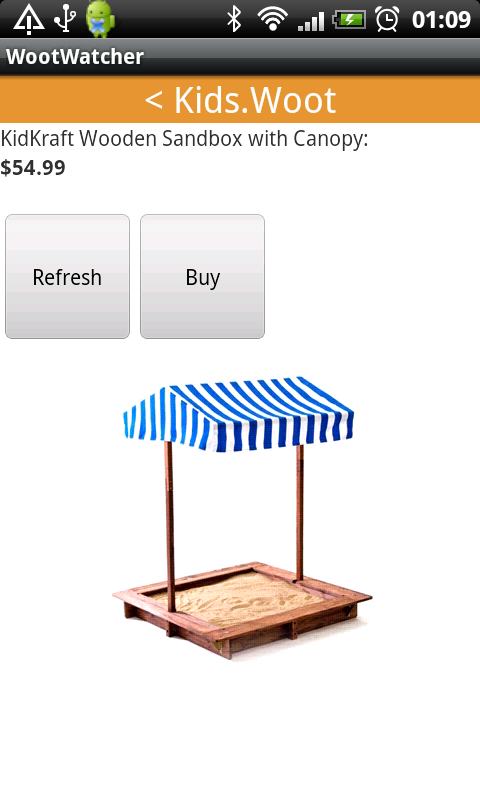 The app also let’s you select which Woot sites to check. 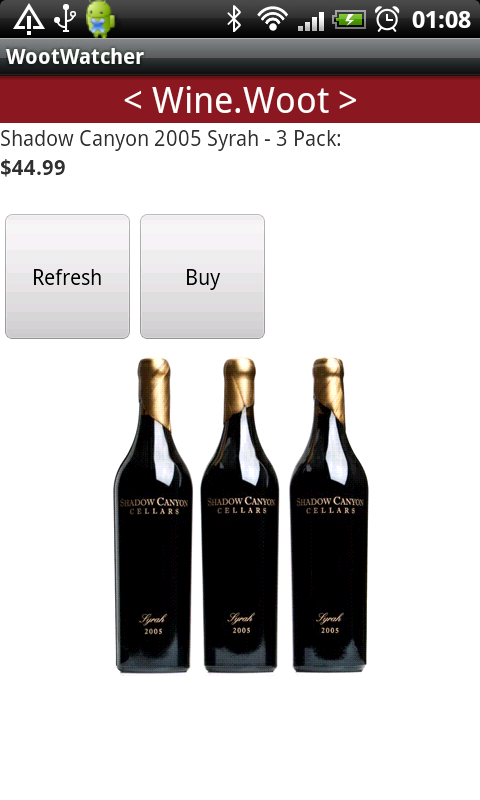 Not a wine connoisseur? Don’t care for Woot’s witty (and soft) shirts? Simply uncheck the respective boxes and these sites will be omitted for you. 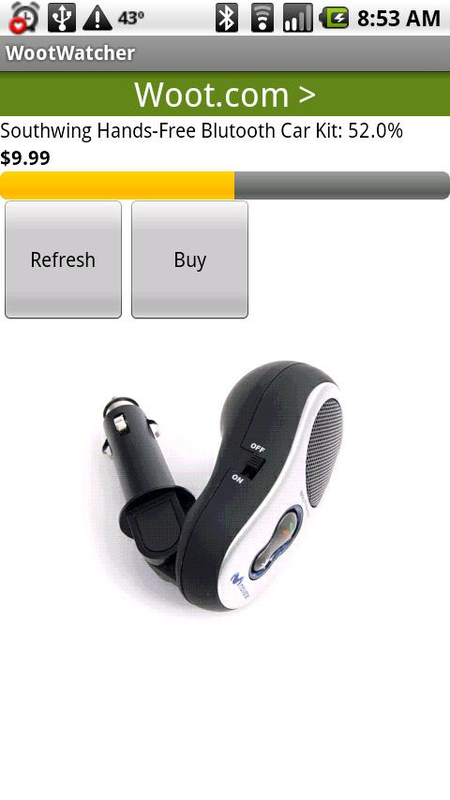 WootWatcher is a must have if you’re a regular Wooter. 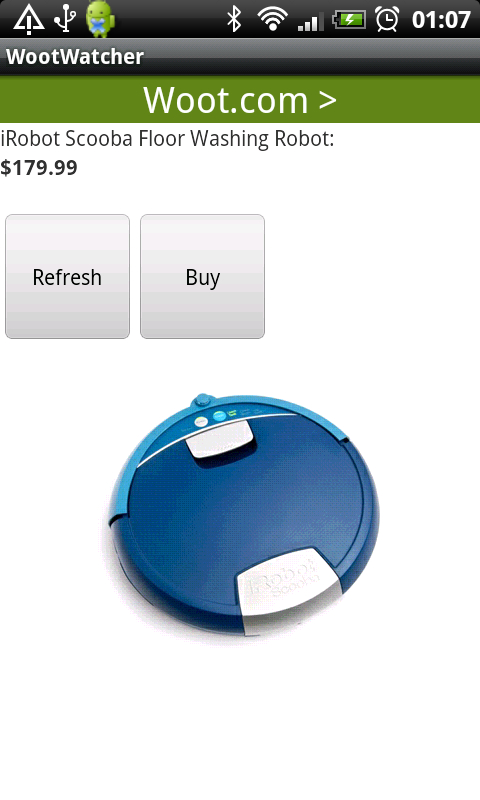 It’s lightweight and is intelligent in the way it checks for updates, saving precious battery juice. 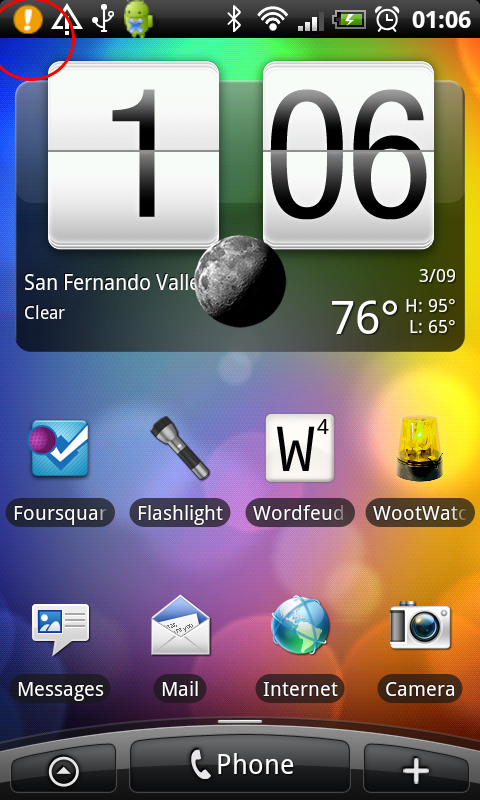 WootWatcher is developed by Ben Tobin and is available for free from the Android Market.